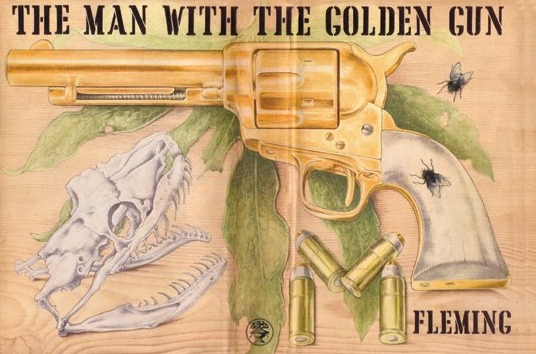 Chopping expanded his canvas, so to speak, for the final work he collaborated with Fleming on The Man with The Golden Gun. Because Scramanga’s golden pistol was too long to confine to a single panel, the artwork extended to the back of the jacket. Apparently book sellers were not enamored with the experiment because it required them to open the book to display it. 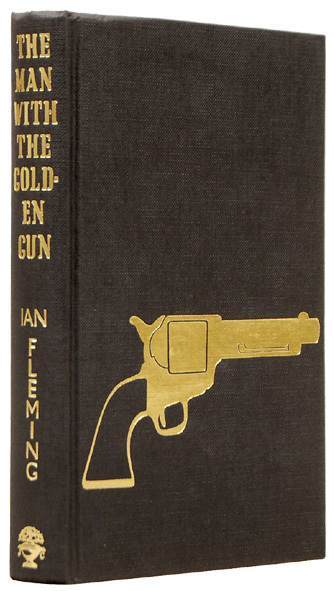 When The Man with the Golden Gun was first published a very small number of copies were decorated with a golden gun. For some reason, either the expense or practicality of applying the design, this was quickly abandoned and copies in this state are now rare. Richard Chopping was paid 300 guineas for the artwork.